Our engineers have long time experince in PLC and HMI programming so we are able to offer solutions in a several branches of industry. We can develop projects from a small control up to a large process units. We know hot and cold rolling mills technologies, liquid storrage, piping, transporting technologies, hydraulic movements control, drive control, data acquisition and many other. Most used programming platform are for us LogiCad and SIMATIC S7, PCS7, but we know also another PLC programming tools like Tecomat, Fanuc, ABB... We are able to maintain, renew or extend older PLC software based on SIMATIC S5 platform. We can also offer solutions for process data acquisition. Because of experience with JAVA programming and Android applications developing, we can distribute these data to the mobile phone or tablet and provide the access of data from process anytime and anywhere. Our high priority is testing of our PLC sw products. To decrease commissioning time on site, we test together with simulated field conditions. If necessary, we also participate on integration test phase. In coordination with customer's schedule, we participate on commissioning phase of project and make our PLC programm running on site. Depending on customer's request, we make a detail engineering and design of our HMI pages. Our HMI pages are based on well-arranged important information. We take in account all aspects and norms valid for appropriate project and customer's location. After HMI structure and pages developing, we test our HMI software on-line, together with PLC programm and communication with another systems. We can use several types of communication for data exchange with cooperating systems (OPC server, TCP IP, RFM...). During commissioning of HMI we make also operator's training. Most used SCADA platform for our HMI developing is WinCC, and previously even FactoryLink. We are able to maintain, renew or extend older HMI software made in FactoryLink. 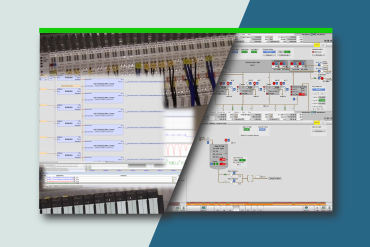 We can develop even for another SCADA systems to prepare for example solutions for smaller HMI projects.